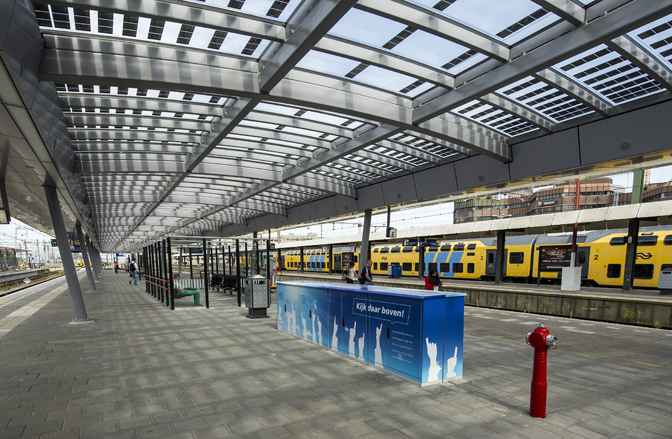 susstation – supporting sustainable stations is an initiative by 5 organizations from different european countries to support the construction of sustainable railway stations. Local authorities, the rail industry and other interest groups are working together across North West Europe to demonstrate and encourage sustainable station schemes. Deutsche Bahn AG has launched its “StationGreen” programme, under which the first CO2-free Railway Station in Germany is being designed. The first station in Kerpen Horrem officially opened in june 2014, while the StationGreen for Wittenberg is in the planning stage, with operation expected to start in 2017. The pilot project in Kerpen-Horrem will be a test bed for new technologies and the first CO2-free Railway Station in Germany. The building costs for a StationGreen with the dimensions described here are around 20% higher than those for a conventional passenger building without sustainability aspects. – Natural and artificial light: the buildings are designed to make maximum use of natural light and provide transparency for good orientation. In addition to large windows, reflector elements redirect natural light into inner areas of the building. The lighting concept combines the use of daylight with energy-saving LED technology. – Photovoltaics and solar thermal energy: the building concept features a photovoltaic system that feeds energy back into the public electricity grid. The total output for a year is around 35,000 kWh. Heating via solar collectors is also utilised to generate hot water for facilities inside the building. Depending on the size of the roof surface, the Photovoltaic system can lead to a zero-energy or even a plus-energy building standard being reached. – Geothermal: a heat pump system is set up that allows water to circulate via probes in the ground and delivers energy to heating appliances and underfloor heating. Wells with a total depth of 1,000 metres are required to cover the heating load of around 26 kW. The holes have been drilled in a row in front of the station building, spaced at a minimum distance of 6 metres, and connected to a heat pump. This pump will produce enough energy to satisfy the overall heating demand and, from its location in the mechanical room, distributes heat and cool air throughout the building. – Design: prefabrication and large-scale formats lead to shorter assembly times at the building site. This is a decisive factor on construction projects where train services continue running, as is the case in Horrem. In addition, wood as a material has the advantage of being a fully renewable resource, as well as being extremely strong and therefore ideal for use in load-bearing structures. A pillar-free hall with a waiting area has been designed to satisfy the demand for transparency and a large amount of natural light, which is easy to realise due to the large span width of the ribbed timber construction. StationGreen buildings are designed to let in a lot of light, by creating large glass fronts and using light-reflecting fixtures to dynamically manage both natural light and artificial light, blending them as needed throughout the day. The generous use of glass also ensures high transparency, aiding passengers’ orientation. The model’s facade is made up of around 52% glass, which in the winter months means that the sun’s energy can be used to heat parts of the building. – CO2-neutral operation: in order to achieve annual primary energy consumption of 0 kWh, the total energy requirement calculated for the year is met by the output of the photovoltaic and thermal solar energy systems generated over the whole year. The total annual energy requirement includes energy for heating, cooling, ventilation, hot water and lighting, but not the energy required for operations and sales. For this second category, electricity produced from renewable sources is purchased.